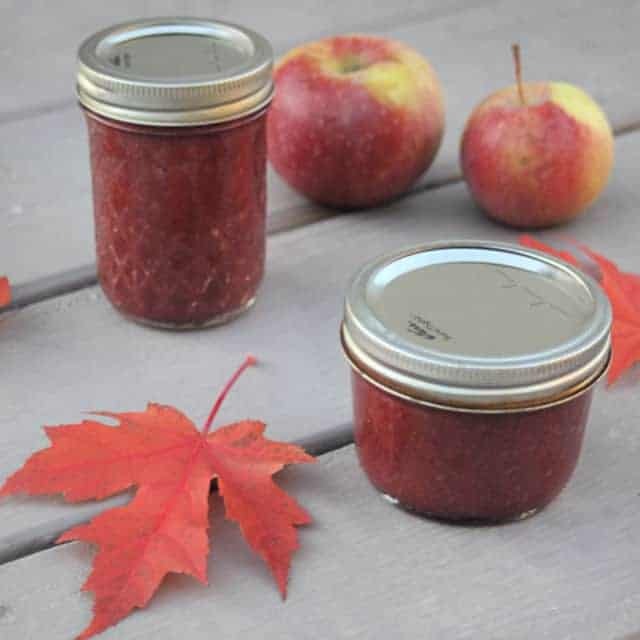 Preserve a bit of fall's sweet and tart offerings with this cranberry apple butter. This easy preserve has just a few ingredients and is full of fruity flavor. No one needs something complicated and deeply involved this time of year. There's plenty of parties, feasts, and more happening in fall. This has just a handful of ingredients and comes together easily. The only long part is the cooking down of the puree into a thick butter but that can be relatively hands off. Most fruit butters include a healthy dose of spice. I skipped the spice in this cranberry apple butter because I wanted to highlight the flavors of the cranberries more than anything. A person could add some cinnamon or other spice as desired – a couple of teaspoons at most. One could cook this fruit butter down on the stove. Do this over a low heat and stir almost constantly to prevent scorching. For ease, however; cook it down in a slow cooker. Simply leave the lid off and set the slow cooker to high. Stir this mixture occasionally. It will take a couple of hours and won't need as much attention as it would on the stove. This thick and creamy spread is perfect on toast. It's great in a peanut butter and jelly sandwich. 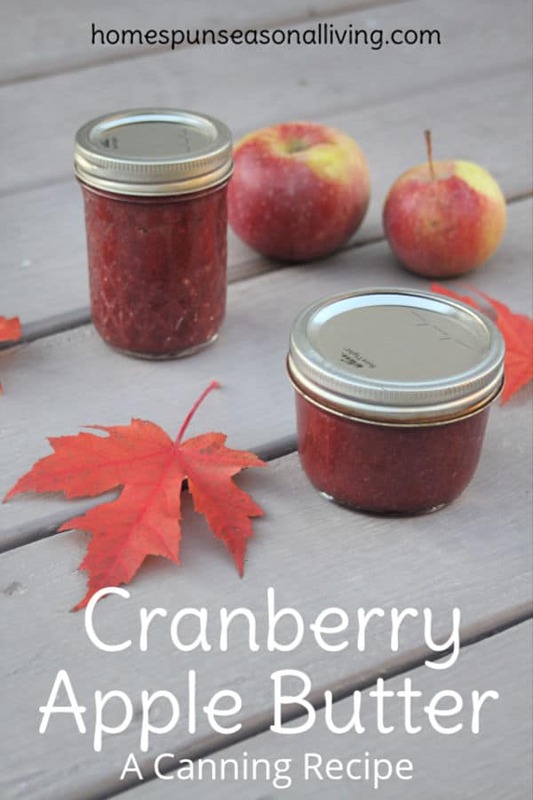 Use it as an alternative to cranberry sauce on those leftover turkey sandwiches. Don't forget to include it with some sharp cheese and crackers on holiday buffet. It will also make a great gift. Toss it in gift baskets with bread. Add a ribbon and a label for hostess gifts. A simple tart and sweet preserve that highlights the best of fall's fresh fruits. Combine the cranberries, apples, lemon juice, and water in a saucepan and cover. Bring to a simmer over medium heat and cook until the apples are soft and the cranberries burst. Puree the cooked mixture until smooth. Return the puree to the saucepan or slow cooker. Stir in the maple syrup. Cook the mixture until thick. When done the butter will mound on a spoon. Prepare water bath canner, jars, lids, and rings. 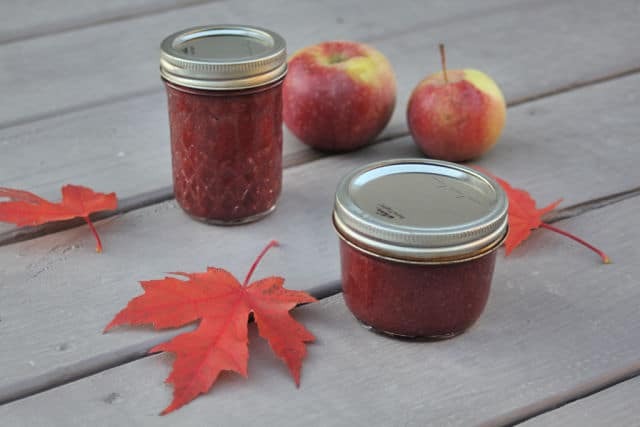 Pour the cranberry apple butter into jars leaving 1/4" headspace. Remove air bubbles, secure lids and rings. Process in a boiling water bath for 20 minutes (adjusting for elevation).